On September 25, 2017, the NIH published new instructions for preparing and submitting grant applications for deadlines on or after January 25, 2018. The January 2018 edition of The Grant Application Writer’s Workbook – NIH Version has been updated to comply with those instructions. Although the changes are not as extensive as they were in 2016, they are nevertheless significant and our updated Workbook provides you with everything you need to be aware of in order to be compliant with the new guidelines. In this Workbook edition, we offer guidance on how to cope with the newly introduced PHS Human Subjects and Clinical Trials Information form that consolidates into two parts of the application all considerations pertaining to the use of human subjects. This is the most significant change in the new instructions and reflects NIH’s ongoing efforts to enhance transparency and rigor of NIH-funded clinical trials (see blogs from 3-13-16, 4-4-16, 11-16-16, and 1-25-17). Coincident with the introduction of the Human Subjects and Clinical Trials Information form, what qualifies for inclusion as appendix material for applications due on and after January 25, 2018 will become further restricted and information that was previously allowed will no longer be permitted in the Appendix section. At the end of August 2017, NIH rescinded all previous notices on new and early stage investigators (NOT-OD-08-121, NOT-OD-09-013 and NOT-OD-09-134) and replaced them with the “Next Generation Researchers Policy” (see NOT-OD-17-101 and previous blog post of 10-3-17). As a result, the section of our Workbook that pertains to review of early-career investigator R01-equivalent applications has been updated to help you deal with this change. 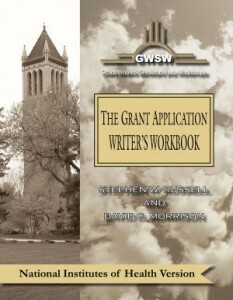 GWSW has long advised writing parts of your application out of the order that they appear in the Table of Contents, i.e., the order in which you will submit them. Based on the sum of recent changes to the NIH application instructions, there was a need to partially reorder the sequence of tasks within the writing timetable template in this Workbook edition to enhance their logical flow and thereby avoid internal inconsistencies across different sections of the application. Finally, new examples of well-written Specific Aims, Significance and Innovations sub-sections of the Research Strategy, Project Summary/Abstract and Project Narrative sections have been included in this Workbook edition that effectively apply the concepts we recommend you use to develop and integrate these critically important sections of your own application. In the event you’ve never owned a copy of the NIH version of our Workbook or if your copy is two years or older, we strongly recommend that you consider purchasing the January 2018 edition as we think you’ll find it to be an indispensable tool in writing your next NIH grant proposal.